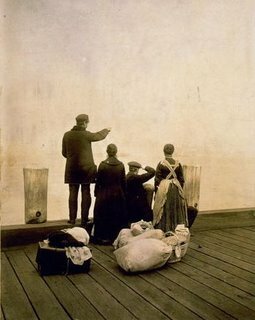 Genealogy Roots Blog: Ellis Island? Castle Garden? Which One? And When? Those searching mid-nineteenth-century ship logs will likely soon discover that the handwriting was often little more than a scrawl, and can be very difficult to decipher. No doubt the poor soul whose job it was to record all the names and information these logs contain found it a tedious chore that didn't warrant his finest penmanship. After all, who would ever want to review these documents once they were filed away? So if your searches of indexes fail to turn up the individual for whom you are searching, don't despair! That person may simply be hiding behind the tired, impatient handwriting of the agent that stymied the equally hard-pressed indexer. Obviously, this is a common issue with any index of handwritten records, but many of these ship logs are difficult to read even from good-quality microfilm images. Of course, searching under these conditions may mean resorting to visually scanning ship logs that cover weeks, months, or even years. So be sure to maintain a research log, and be willing to make the effort in stages. Your eyes will need the break! Took me a long time to find my family. They had my grandfather's first name as Reznzt, it was actually Ernst, big difference, but I found them by the names, ages and sexes of the children that accompanied him. Then I could see why someone would make my grandfather's name so far off. It was difficult to read the writing and I could also see it was Ernst (since I knew what it should have been). I was able to send the updated information to Ellis Island so that future archivists would have the correct information.